As a consumer, you like to walk into a place of business, doctor's office, or a store and see that it is tidy and clean. It can be a major turn off if the first step through the door is on to a dirty carpet. After all, a first impression is what stays in mind forever. As the person who is operating a business, you want to make that first impression the best it can be to keep your customers coming back. We all know that offices and stores can be very busy and carpets can take a beating with all of the foot traffic each day. It is essential to maintain these high traffic areas to not only extend the life of your carpets but, more importantly, have a place of business that is easy on the eyes. *Be sure to ask if the company you are investigating uses environmentally friendly cleaning solutions. According to an article published by the Global Healing Center, you want to be sure the best organic carpet cleaners are being used; this includes solutions that are non-toxic and biodegradable. Not only will these solutions assist in extending the life of your commercial carpets, but they are chemical free and leave the air clean and safe for employees and customers. *Ask about the method used for cleaning your commercial carpets. You want to be sure that dirt is extracted before the cleaning process begins and that there are not long drying times. If it is damp for too long, this could lead to mold or mildew growing under the carpet. *Ask about the equipment being used in the cleaning process. The machines should be EPA registered and be able to trap pollutants, such as pet dander, dust mites, allergens, and mold spores in a filter, so they are not released back into the carpet. *You want to be sure the professional company you are using is insured and bonded before they come into your place of business. *A good professional carpet cleaning coming will be flexible with their hours of service. This allows you to continue with business as usual instead of interrupting your day or inconveniencing your customers or patients. However, a carpet that is professionally cleaned may well last for many more years than one that is not. Also just vacuuming your carpet weekly is most unlikely to remove all of the fleas, ticks and dust mites that harbor in it. Indeed most people would be shocked as to what is lurking below the surface of their carpets. Many people put up with carpet stains caused by red wine or coffee being spilled on them, or the constant smell of pets little accidents have occurred. The plain fact is that water, soap, and a scrubbing brush will not remove the majority of stains or smells from your floor, only professional carpet cleaning will. To clean a carpet professionally, you will need to have a carpet that can accept deodorizers and sanitizers to get rid of pet smells or other strong fouling. Also, some carpets will be of such a fine nature that they may require "Dry cleaning" whereby you need to use a powder based cleaner to sanitize them without damaging the carpet with a liquid based cleaner. To remove stains such as red wine or coffee (a typical culprit in staining office carpets), you will need to use 'spot cleaning' by using a pre-spray and stain remover and allow it to soak in before using a professional carpet cleaner to go over it with. However, as with most things, prevention is better than cure, and you should consider the use of protective treatments that can be applied to carpets when they are first laid down. Such treatments can provide huge long-term benefits on a floor at home or work. So as you can imagine when it comes to keeping a clean carpet things can prove very hard work, however by using the right floor cleaning supplies you can remove even the hardest of ingrained stains. A good cleaning supplier will not only be able to provide the latest range of carpet cleaning machines but also advise on what preventative treatments to apply to keep dirt and stains at bay. The use of good carpet cleaning products and a cleaning machine can be a worthwhile investment, like the ability to remove a serious stain can mean not having to replace a carpet, saving hundreds or thousands of pounds. Loop pile carpeting of low density is a popular choice regarding office carpet cleaning, particularly as it is often chosen for areas of high traffic in schools, for example, or medical facility buildings. This kind of carpet is very smooth and is not likely to become matted, crushed or uneven, so there is no problem with moving rolling traffic such as wheelchairs over it. 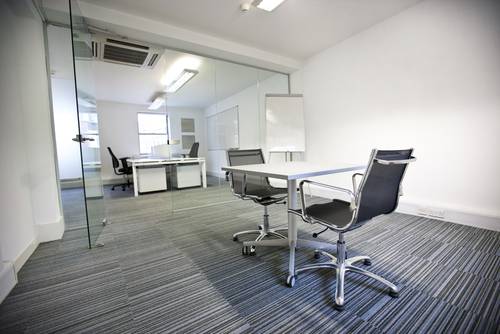 This makes it very practical and an easy prospect for a business cleaning service that specializes in office carpet cleaning to deal with. Tufted carpets, instead of being woven, are stitched and have a backing that keeps the tufts in position. The pile is a little higher than that of loop styles, but not as plush as that of woven ones. Loomed carpets are long-lasting, for up to ten years, and are often found in hotels or airport lounges. 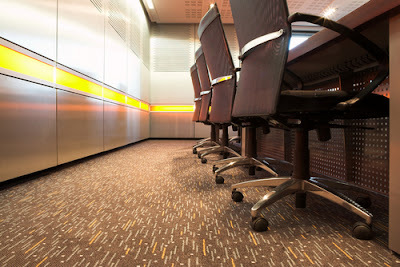 When these kinds of carpeting are fitted, the idea is that they should not need a lot of commercial cleaning, but should be suitable for day to day maintenance with light cleaning using a vacuum cleaner. 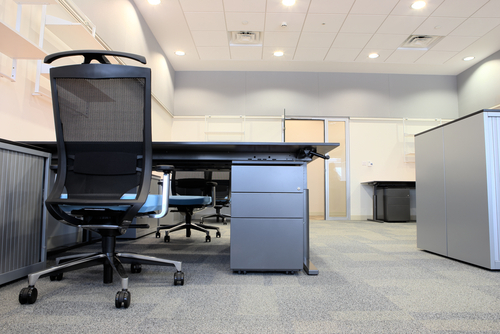 When nylon carpet is chosen for a commercial building, office carpet cleaning may not be required as often as with other types of carpet. Nylon carpeting puts up a good show and lasts well even in areas that get wet and muddy, like a school entrance hall after playtime on a wet day. Some nylon is used in about 65% of all carpets, which shows what a good reputation it has for durability. However, even nylon carpet can't resist dirt and stains forever, and this is when commercial cleaning will not only restore the carpeting but add a protective finish to it.